Does this make a difference in the performance of the engine? Do you leak less air? Is it enough difference to make it worth doing? Any particular kind of brown paper you would recommend? Brown grocery bag? And what kind of oil do you soak your brown paper in? Standard 10-40 motor oil? Way oil (seems so thick)? Light oil, like 3-in-1 or something like that? When I was in San Diego, the store gave free gasket material with any alcohol purchased. Perhaps the authorities have a negative stereotype of mechanics? Grease is useful with complex gaskets to stick them in position. fcheslop, do you soak your manila envelope with anything? Or do you use it dry? Pedro, Brian, the cardboard gasket material seems thicker than I was picturing. There are a couple of place on my engine where I don't think I could handle that additional thickness. But maybe I need it! 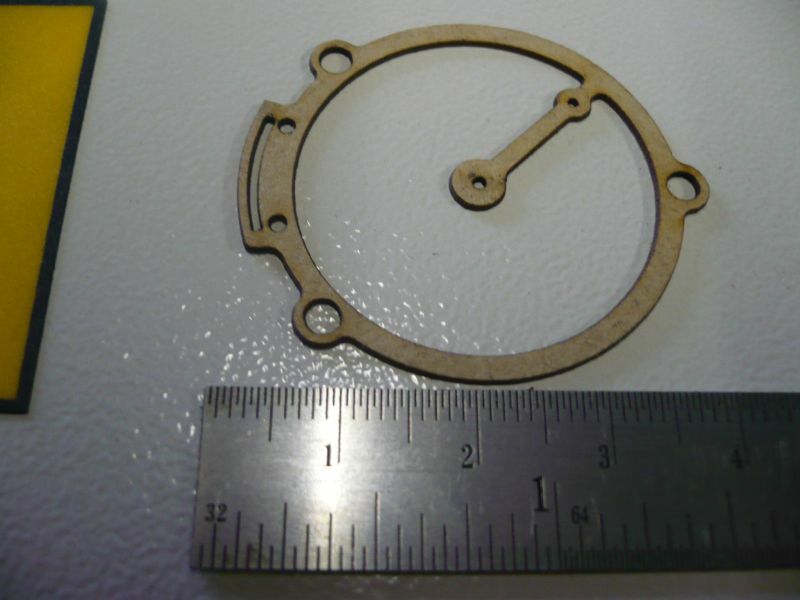 Get someone with a laser to cut the gaskets for you, do a stack and you are set for life, the quality is awesome. The hole in the middle is 1mm, the hole on the stalk is 1/2mm as is the annular groove. 14 seconds to cut this. Thanks for the additional info fcheslop. John, that's a pretty impressive gasket! Not sure I'm quite up to that standard yet, but that looks beautiful! That's the beauty of a laser, if you can draw it, you can cut it. Hi Kim, seeing the discusion about gaskets, I will take the opportunity to show which system I have in use. May be it is worth to think about it. In your country is a company based, selling low cost cut plotters. My one is the 'portait'. In the included software you can import any dxf file and cut your gasket. 10 pieces in one go, if necessary. My gasket paper is from a car/bike part shop down the road, between 0,15 and 0,35 mm. Kim if you plan to run your engine regularly and on steam use gaskets. If you plan run them on air and to put them on the shelf with other engine and run them now and then don't use gaskets at all. My engines have no gaskets on them and leak very little and has no effect on them running. They have been placed in Doll cases to keep them from tarnishing quickly. I have had two of them in cases for over a year and have not tarnished yet and they are all brass. I do run them now and again for my grandsons. I'm with Don on this. I have only used gaskets on my Stuart 10V and that was because they were provided in the kit. My other engines (only 2 but both twin cylinder) both run without gaskets although I have used a smear of non-setting silicone gasket compound on jointing faces. Gasket goo is a LOT less time and patience consuming than paper! Having said that, I run my engines on air only so if you are going to be using steam this opinion may be invalid. Jo laser I can understand but what's an iron ?